When the manual sensibility is refined with tireless devotion and it joins the will to experiment and overcome craft skills, it leads to the discovery of original and unexpected technical solutions. 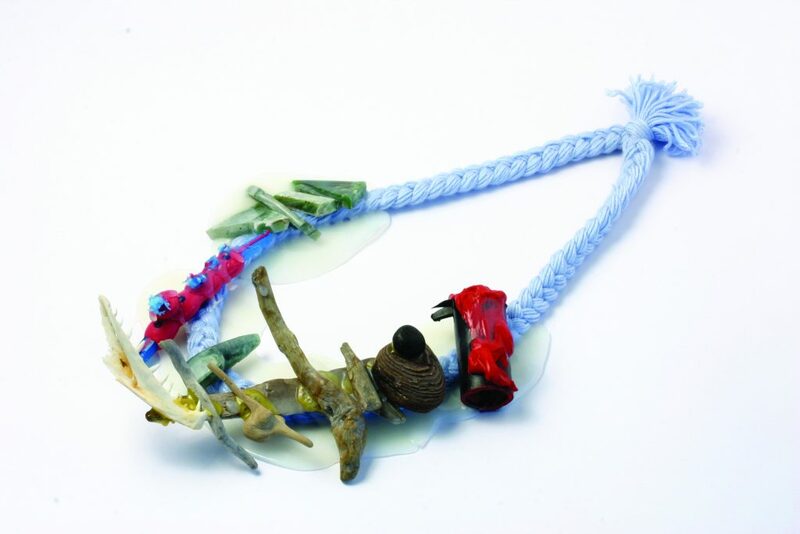 In Stefano Marchetti‘s work, guest of Preziosa 2008, the exchanges between goldsmithing and other expressions of art are very strong: he imports into jewellery techniques that belong to other fields, renewing them and giving them new breath. Fascinated by “Venetian murrina” and mosaics, he begins a survey on the perceptive effect of the colouristic glow. 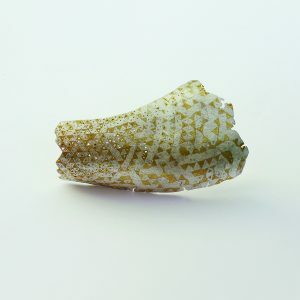 Using techniques of Japanese origin, such as “Mokumè parquetry” or “Mokumè Gane”, he manages to return the pictorial fragmentation of mosaic techniques in goldworking, welding together a series of small geometric tiles composed of different metal alloys, such as red and yellow gold, copper, silver, shibuichi. Thanks to a discontinuous and jagged plot, these jewels look like remnants of an ancient past that vividly preserve the historical memory of humankind. That experimental attitude of Marchetti comes from his training at the famous Paduan school and it is inscribed in a period, the last decades of the twentieth century, which rediscovers Eastern techniques. 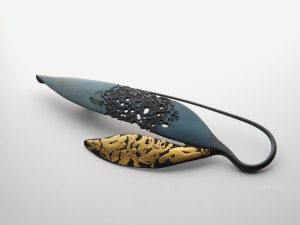 The German Sibylle Umlauf reutilises a Japanese traditional inlay technique that is called “Nunome-Zogan”. That method uses a metal plate, which is repeatedly scratched with a chisel over the entire surface to obtain an irregular texture. It serves to accommodate decorative patterns of thin metal leaves that are beaten to adhere. The surface preserves its irregular aspect and plays on the contrast between the colours of the different metal used, such as iron, gold and silver. 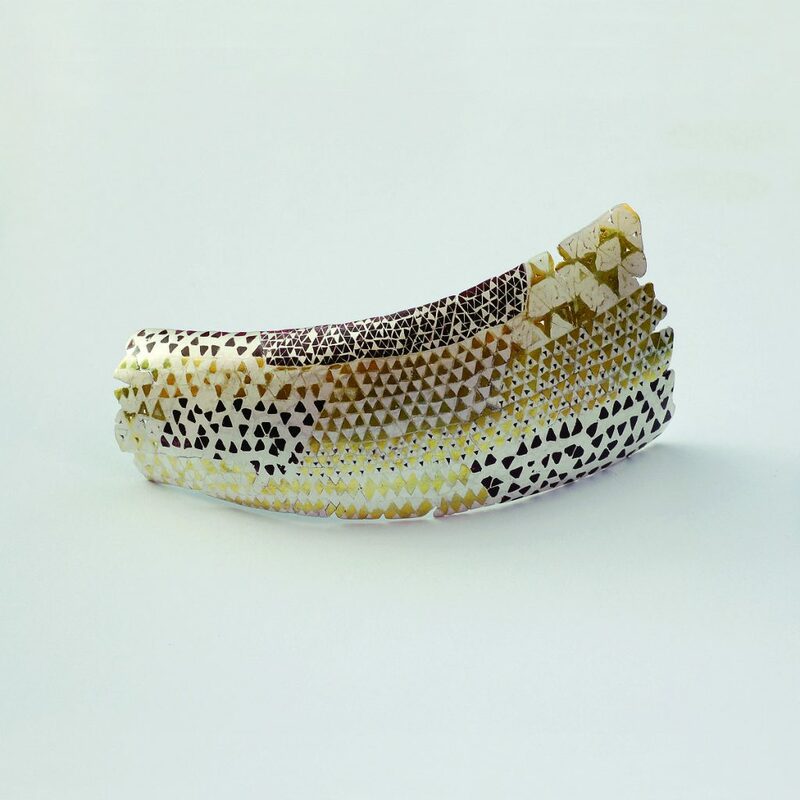 She revitalises this ancient technique to make modern jewellery that preserve a primitive taste, depicting symbolic forms like the snake, the scarab, the eye or a natural world of elegant and sinuous leaves. LAO invited the artist to Preziosa 2017 and to hold workshops to teach that oriental inlay to the students who experimented with it. 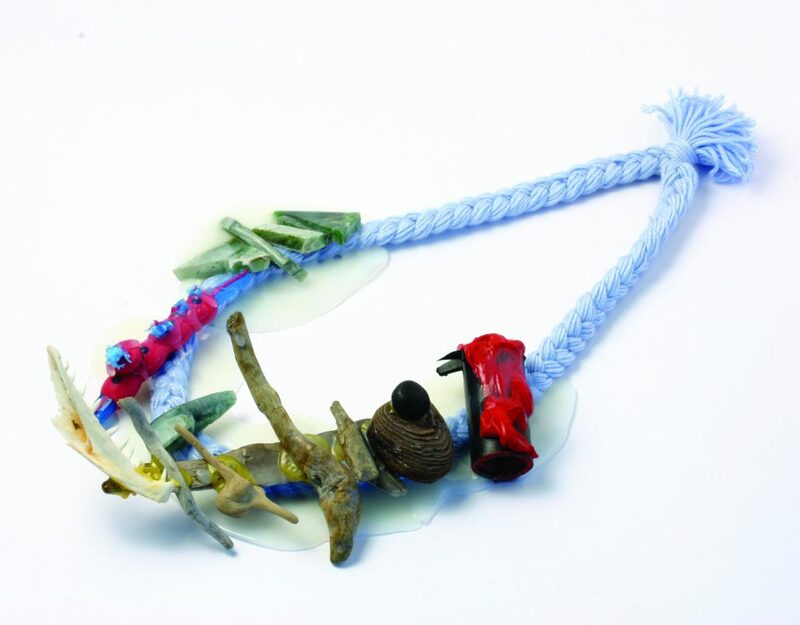 Arata Fuchi, a Japanese student of LAO who exposed in Preziosa Young Exhibitions, starts from a South Korean technique called “Kuem-boo” to develop an original way of expressing himself in jewellery-making. Kuem-boo consists in fixing a gold leaf on a silver base through heat and pressure. Before putting the gold plate, Fuchi adds the silver powder that sprays on the silver surface. 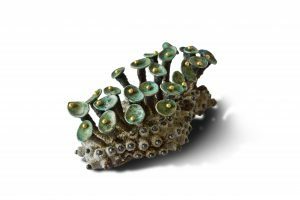 He called it “pulverization”, and the outcome is a seemingly soft and swarming covering inspired by the organic world. To enrich the surface, it also puts small balls of gold, using heat to fix all the parts together. Instead of flattening on the surface, gold acquires volume, making these jewels extraordinarily alive and germinant. 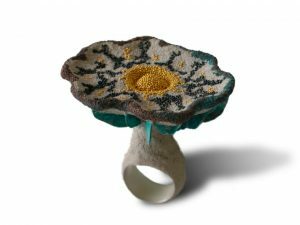 The metallic material draws golden galaxies on hats of mushroom-like rings or hides in the heart of tentacled anemones or in the corolla of blossomed flowers…. «it is not the material that creates the result, but the ability to “fertilise” it with ideas»*.